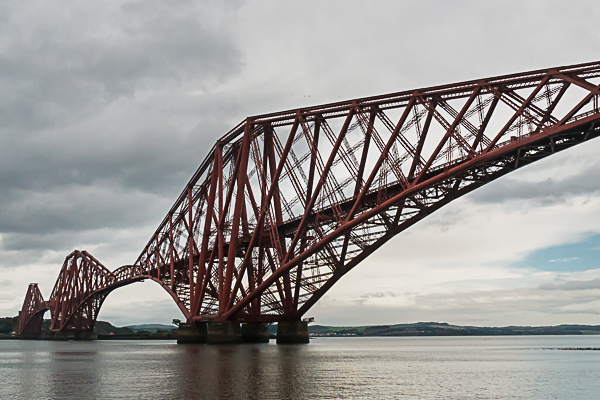 Although I enjoyed exploring the Scottish Highlands and seeing tremendous castles, my real reason for going to Scotland was to see the railway bridge that spans the Firth of Forth, the Forth Bridge. I’ve been looking forward to this for a decade or more and at last, my dream came true. It took some effort on my part, but I did it. Having purchased a ticket before leaving the states, I abandoned the tour group to do my own thing. I was determined to take a tour of the Forth. On a rainy morning, I caught a bus to Queensferry, the town where I would catch the tour boat. For hundreds of years, this place was the ferry crossing, hence the name. I followed my fellow passengers along the pier to the boat as the railway bridge loomed above us. 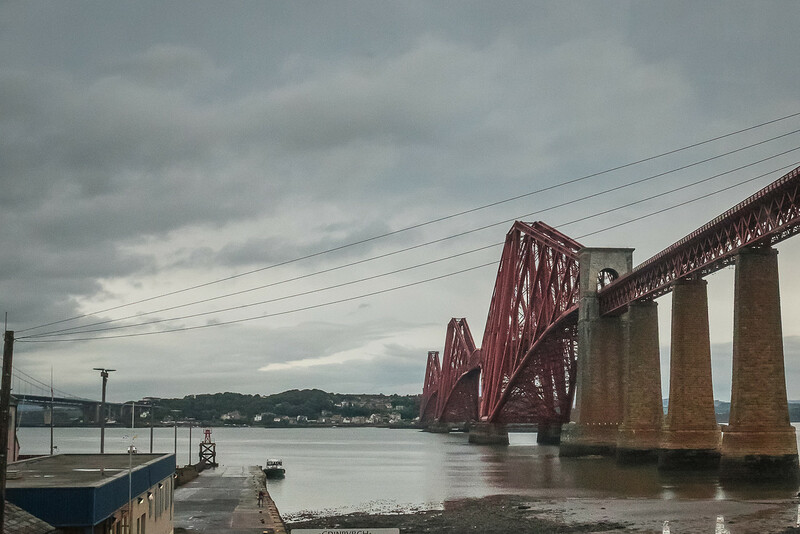 What’s so special about the Forth Bridge? After several years of construction, it opened in 1890 and is still in operation with about 200 trains crossing it each day. 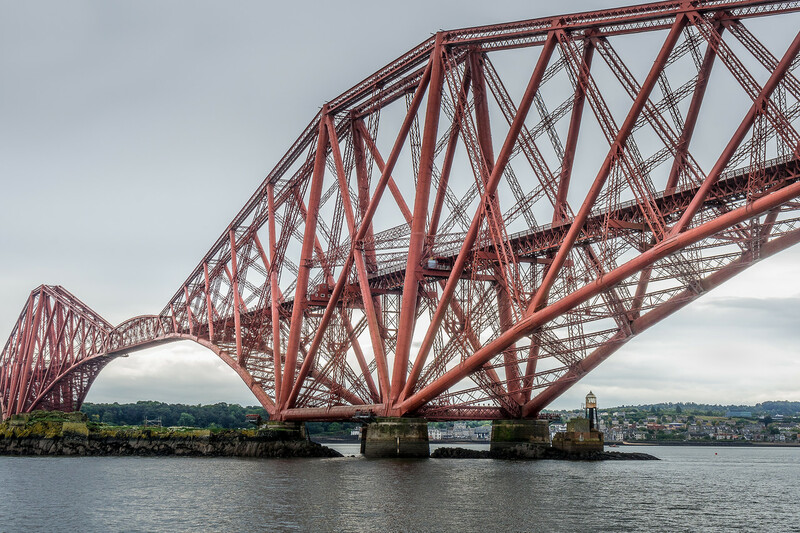 It’s a cantilever bridge built of iron, over six million rivets, and good old-fashioned Victorian engineering. The above image shows one of the three cantilevers. A cantilever is similar to a diving board. The central tower supports the two arms, each arm balanced like the aforementioned board. The forth is about one and a half miles wide at this point. It was too deep for the usual pier type construction. Instead, the builders sank caissons, the supports, deep into the riverbed. The cantilevers stand on these four supports. 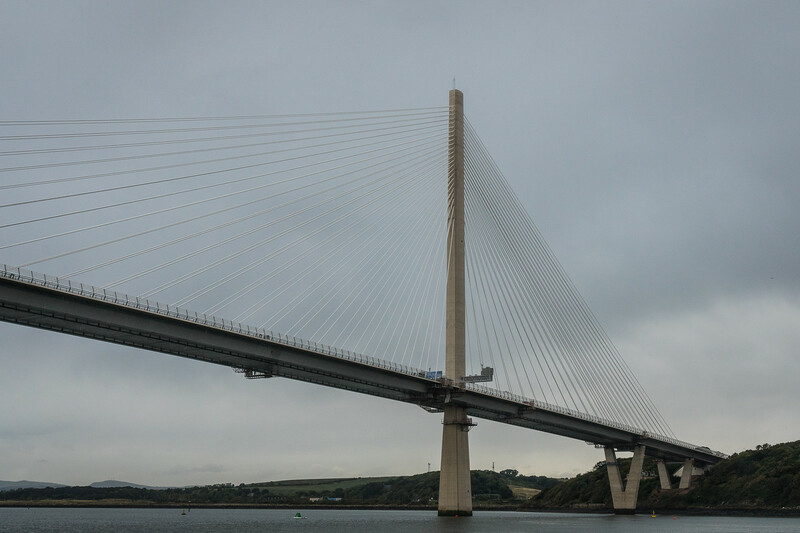 The web of struts and trusses ensure that the bridge is stable in just about any storm. That’s as technical as I dare attempt. 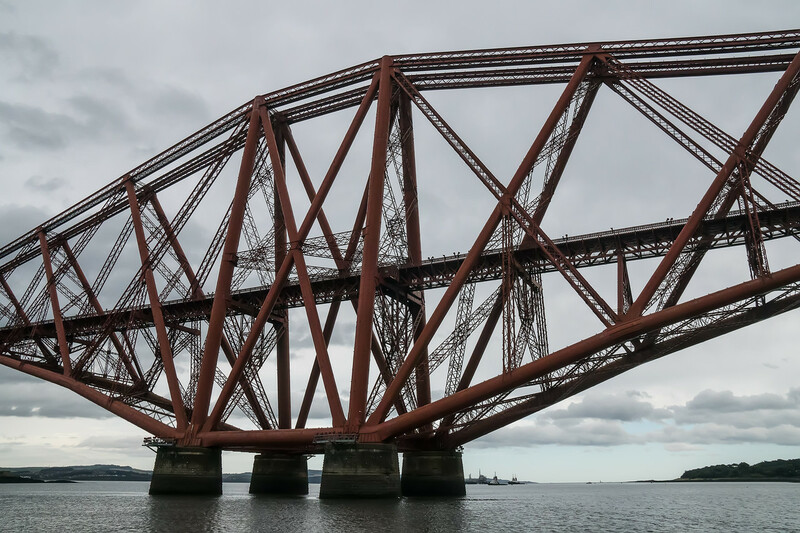 I never tire of looking at this structure but you may, so I’ll tell you a bit more about the Forth. The boat ride was enlightening. I didn’t know that the Forth was the site of the first German air battle over the UK in World War II. It took place in October 1939. German U-boats also patrolled the Forth and from time to time an old unexploded mine is discovered. There are several islands in this area of the Forth. We stopped at Inchcolm, where passengers could disembark. They would catch another boat later. 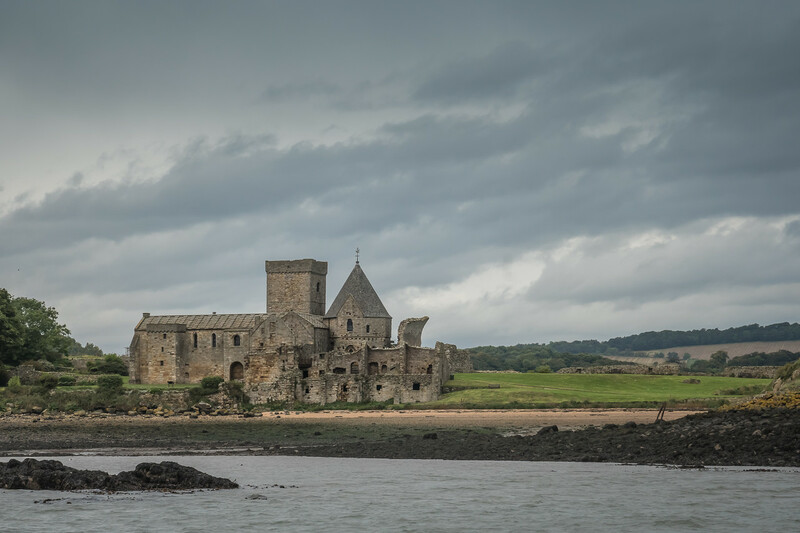 We could see Inchcolm Abbey from the boat. This is another abbey founded in the 12th century by David I. It’s also one of the best preserved; perhaps its island location saved it during the Reformation. Inchcolm has another attraction, very different from the abbey. Just offshore is a small island. 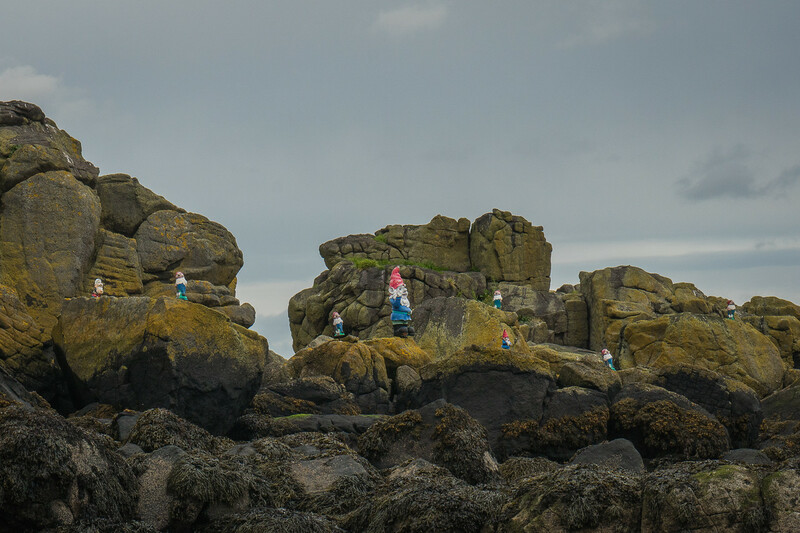 It’s the home of the gnomes. I’m not sure what the story is with these. I think the one in the center is waving at our boat! There are birds and seals of course; they lounge on the rocks and buoys. 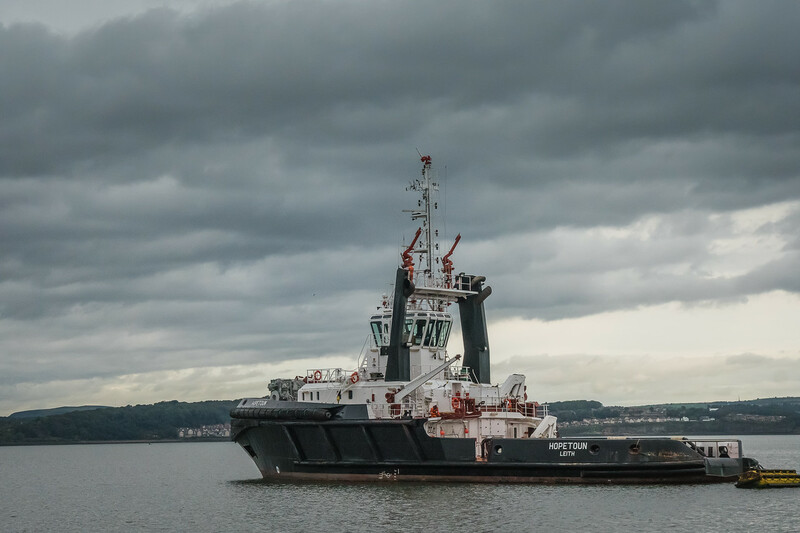 I also saw tugboats, impressive boats at that. The Hopetoun is one of the biggest and most powerful. Like any tourist, I took a picture. Of course, it’s about the bridge! The weather was getting worse; there were a few sprinkles. I stayed out because I didn’t want to miss the bridge when next we sailed under it. Like a few others, I wanted a photo of a train crossing the bridge. As you can see above, there are two other bridges on the Forth. The suspension bridge, the Forth Road Bridge, was closed during my visit. The bridge in the distance is the new Queensferry Crossing. It opened in 2017. Our tour bus crossed this bridge when we first entered Edinburgh. It’s modern and sleek but for me doesn’t have the appeal that the railway bridge has. Therefore I have to end with a photo of the Forth Bridge! 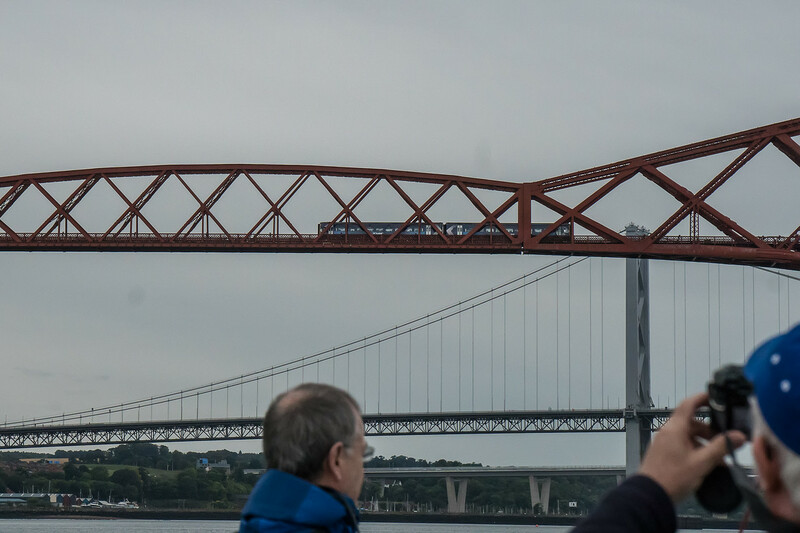 To see more images from my boat ride on the Forth, please click here.